Move from Adobe® FrameMaker® to software optimized for publishing modern web content. Streamline the process of creating and publishing Synergex’s documentation through topic-based authoring. Efficiency: Flare’s topic-based authoring, condition tags, and variables speed the creation and delivery of HTML5-based documentation. Collaboration: Integration of MadCap Flare with Apache SVN strengthens collaboration and provides version control of content created by the technical writing team. Collaboration: MadCap Flare’s integration with GitHub fosters collaboration and enables version control of content. Intuitive user experience: Responsive design, search, and an errors tab provide an inviting and interactive website where users can easily find the information they need. For more than 40 years, Synergex technologies have been at the foundation of many applications that drive commerce around the world. In fact, millions of users interact daily with systems in e-commerce, global logistics, manufacturing, healthcare, and other industries that are built on or managed by Synergex solutions. Synergex’s flagship product is Synergy/DE, a portable, scalable framework that powers software applications worldwide, from small shops to Fortune 100 corporations. The full suite of application development tools is built around Synergy DBL, a proven business language based on ANSI-standard DIBOL. Also included in the suite are a high-performance indexed database, connectivity tools for remote data and application access, and integration with Visual Studio. To ensure that users are able to maximize their use of their product suite’s capabilities, Synergex delivers responsive HTML5-based technical documentation that makes it easy for customers to find the information they need. Today, the company relies on the topic-based publishing capabilities of MadCap Flare to produce responsive web content, which automatically adapts to users’ different screens, from desktops to mobile devices. Flare was just much more modern and forward-looking than other products we considered, with advanced CSS features. In the past, Synergex distributed documentation in two formats. The company created PDFs using Adobe® FrameMaker® and Adobe® Acrobat®, and also used Mif2Go, a FrameMaker® plug-in, to convert Frame files into HTML for web-based documentation. Over time, however, the technical writing team found the conversion process to be time-consuming and complicated. Additionally, the web-based content lacked visual appeal, wasn’t responsive, and wasn’t optimized for online viewing. Recognizing the need to revamp its documentation, the company surveyed key customers, and then the writers held a doc summit that included internal stakeholders to get feedback. Synergex’s search for new software quickly zeroed in on MadCap Flare. Flare emerged as the clear choice because it provided the advanced capabilities Synergex needed to produce modern web content while enabling the team to publish updates more frequently to keep pace with product changes. While Synergex’s technical writers weren’t able to use Flare’s built-in FrameMaker®-to-Flare conversion tool, they took advantage of Flare’s native XML architecture to develop their own conversion program using C# and HTML Agility Pack, an HTML parser from open source package manager NuGet. The final process involved converting the Frame files to HTML with Mif2Go, then using a custom conversion program to clean up the files and add tags necessary for Flare. Also contributing to the conversion effort was the team’s use of MadCap Analyzer. 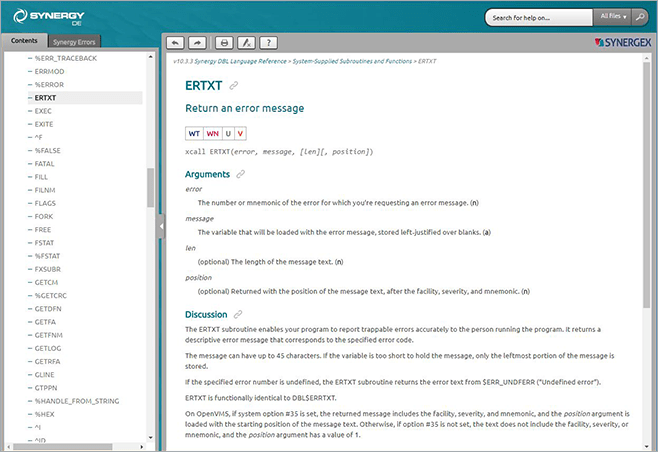 Synergex writers used MadCap Analyzer to find critical issues in the documentation, such as broken hyperlinks or topics that were not included in the table of contents (TOC). “MadCap Analyzer helped us to identify what needed to be done in our conversion program,” Linder noted. Today, Synergex’s technical writers provide customers with an HTML5-based documentation website that is integrated into the company’s corporate website. 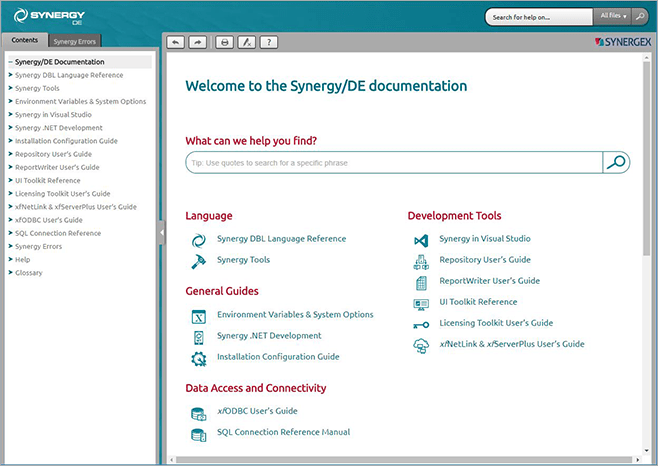 It contains interactive, technical documentation—both converted content and new content created using MadCap Flare—for Synergex’s Synergy DBL language and the tools built around it. To speed the creation and publication of this documentation, the team takes advantage of topic-based authoring features, condition tags, TOCs, and variables in MadCap Flare. In the past when software was released, it took us at least two weeks to generate and publish the online version of the doc. Now, with Flare, we can quickly build the latest documentation. “Flare’s topic-based authoring has enabled us to modernize our authoring approach from the traditional, linear book format of FrameMaker®, which wasn’t as effective for producing online outputs,” explained Linder. The writers use variables in MadCap Flare for product names and use condition tags to mark passages and topics that have yet to be published as well as to mark text about features that are only available in limited-release versions of some of the products. To assist with collaboration and source control, Synergex relies on MadCap Flare’s integration with Apache Subversion (SVN). This integration has helped the technical writing team to better manage, archive, and share content as well as adhere to the company’s disaster recovery policies, and it makes it easier for the writers to collaborate despite working from different locations. Flare’s HTML5 responsive design has helped us achieve our goal of providing a more intuitive, professional-looking, and streamlined user interface. In addition to improving the technical writers’ efficiency, Flare has helped to enhance the customer experience for Synergex users through such features as responsive design, enhanced search functionality, and browse sequences. Meanwhile, Flare’s search bar—where users can type in terms to find what they need—makes it fast and easy to navigate the content. The Synergex team has also added an errors tab using the browse sequence functionality in Flare. Overall, our new documentation is much more contemporary and accessible, and it delivers a far superior customer experience. This wouldn’t have been possible without Flare.